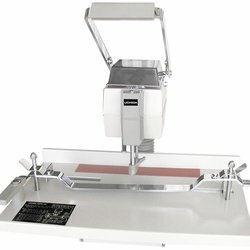 Easy to use electric punches with 6 different preset spacing options. 6-35mm adjustable margin. Features a paper clamp that automatically secures paper in place and automatic centering. The VS25 is highly accurate and safe. All Uchida paper drills are designed for simplicity and ease of use. The drilling position is automatically determined with a slide table. Specially designed and programmed pitch bar allows easy selection of desired hole pitch.